Anna Nicole Smith died yesterday at the young age of 39. I dedicate this post to her. 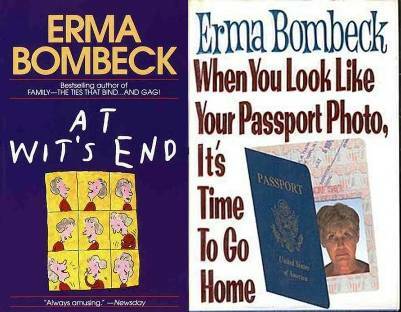 Before her death in 1996, American humorist Erma Bombeck made a list entitled If I Had My Life To Live Over. My mother mailed me a copy a few years ago and I found it recently while going through some random papers. I hope you enjoy her words as much as I do. They are funny and wise, and definitely worth thinking about. * I would have gone to bed when I was sick instead of pretending the earth would go into a holding pattern if I weren’t there for the day. * I would have burned the pink candle sculpted like a rose before it melted in storage. * I would have talked less and listened more. * I would have invited friends over to dinner even if the carpet was stained, or the sofa faded. * I would have eaten the popcorn in the ‘good’ living room and worried much less about the dirt when someone wanted to light a fire in the fireplace. * I would have taken the time to listen to my grandfather ramble about his youth. * I would have shared more of the responsibility carried by my husband. * I would never have insisted the car windows be rolled up on a summer day because my hair had just been teased and sprayed. * I would have sat on the lawn with my grass stains. * I would have cried and laughed less while watching television and more while watching life. * I would never have bought anything just because it was practical, wouldn’t show soil, or was guaranteed to last a lifetime. * Instead of wishing away nine months of pregnancy, I’d have cherished every moment and realized that the wonderment growing inside me was the only chance in life to assist God in a miracle. * But mostly, given another shot at life, I would seize every minute…look at it and really see it. Live it. And never take it back. Stop sweating the small stuff. * Don’t worry about who doesn’t like you, who has more, or who’s doing what. * Instead, let’s cherish the relationships we have with those who do love us. *Let’s think about what God HAS blessed us with. And what we are doing each day to promote ourselves mentally, physically, emotionally. I hope you all have a blessed day.